Sure, owning the latest and greatest smartphones in the market may feel good but if your wallet does not allow you to enjoy such luxury, check out what DiGi is offering in their Hari Raya promotion. Get the HTC One X, One S, Desire C, Samsung Galaxy Note, Nexus, W and a whole list of previous generation phones at a discounted price from DiGi when you sign up for a Smart Plan with the telco today. 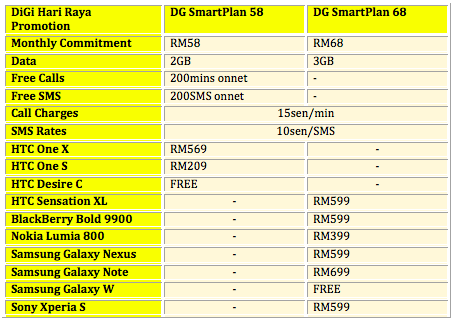 DiGi is offering a total of 10 devices with this Hari Raya promotion, with its new postpaid plan – DG SmartPlan58, as well as the old DG SmartPlan 68, both with different bundles to offer. All the bundles require subscribers to sign up for a 24 months contract with DiGi.